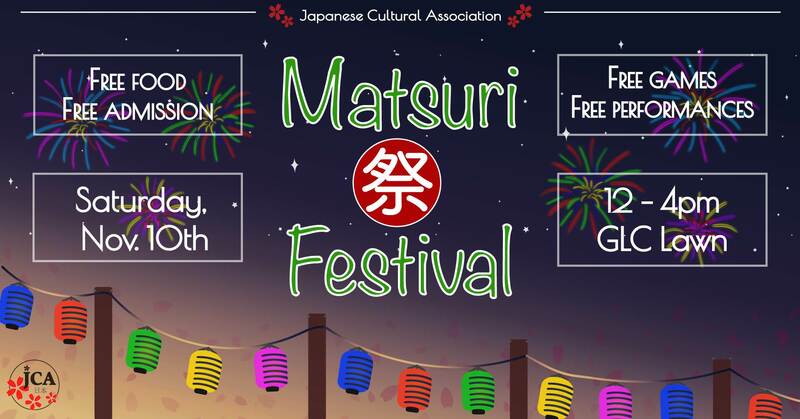 The Japanese Cultural Association (JCA) at Virginia Tech presents their 2018 Matsuri Fall Festival on Saturday, November 10, 2018 on the Graduate Life Center Lawn on the campus of Virginia Tech. JCA is hosting it's annual yearly fall festival showcasing Japanese culture in the form of game booth, food, and performances. There will be booths hosting traditional Japanese games. The event is free and family friendly. All are welcome. Note: Some food options will be available for purchase. To view the event flyer, visit: https://i.imgur.com/CgphjV7.jpg. For more information, visit: https://gobblerconnect.vt.edu/event/2873737 or https://www.facebook.com/events/316545152474645/ or https://www.facebook.com/jcahokies/.